1,069,000 fewer men are working than a year ago. 12,000 more women are working. The careers of Neal Boyle and Scott Hacker couldn't be more different. Boyle, whose education ended with high school, worked 20 years crushing rocks at the US Gypsum plant in Charlestown. Hacker, who holds an MBA, changed firms several times as he moved up the management ranks in New England's financial services industry. But today they find themselves in the same place: laid off and looking for work. And together they represent the face of the current recession, one that is overwhelmingly male. Men are losing jobs at far greater rates than women as the industries they dominate, such as manufacturing, construction, and investment services, are hardest hit by the downturn. Some 1.1 million fewer men are working in the United States than there were a year ago, according to the Labor Department. By contrast, 12,000 more women are working. This gender gap is the product of both the nature of the current recession and the long-term shift in the US economy from making goods, traditionally the province of men, to providing services, in which women play much larger roles, economists said. For example, men account for 70 percent of workers in manufacturing, which shed more than 500,000 jobs over the past year. Healthcare, in which nearly 80 percent of the workers are women, added more than 400,000 jobs. "As the recession broadens, the gap between men and women is going to close somewhat," said Andrew Sum, director of the Center for Labor Market Studies at Northeastern University. "But right now, the sectors that are really getting pounded are intensely male." The divide is far starker than it was in last recession, when the technology crash battered professional and technical sectors in which women now hold more than 40 percent of jobs. From the beginning of 2001 to the beginning of 2002, the number of employed men declined by about 900,000, while the population of women with jobs fell by about 700,000. The male-dominated construction industry held up much better then, too, as falling interest rates began to fuel the housing boom. This time, the housing bust that sparked the recession took construction with it. The downturn spread from the mortgage industry to the investment industry, leading to a credit crunch that undermined consumer spending and manufacturers of consumer goods, like auto makers. Construction firms, in which 90 percent of workers are men, have cut more than 500,000 jobs, or nearly 7 percent of employment, over the past year. Men account for more than 60 percent of employment in investment firms, which through October had cut 1 percent, or 9,000 jobs. That figure, the most recent available, excludes thousands of recently announced layoffs within the financial industry, including large cutbacks at two Boston companies: mutual fund manager Fidelity Investments and State Street Corp., which provides a variety of services for investment firms. Hacker, 49, of Providence, worked for SS&C Technologies of Windsor, Conn., which also provides service to investment companies. When SS&C recently lost a client, it cost Hacker his job as manager of corporate governance. Several weeks later, he's talked to recruiters and staffing agencies, but all they have to offer are short-term contract jobs. And even so, he has yet to see a company hiring manager. "I've been laid off before, but I've always managed to find work pretty quickly," he said. "But I've never dealt with this kind of financial meltdown." Many analysts expect the investment industry that emerges from the financial crisis to be significantly smaller, with fewer jobs. Still, said David Autor, an economics professor at MIT, highly educated workers like Hacker are likely to fare well in an economy that values technical skills, analytical abilities, and advanced degrees. "These guys will bounce back," Autor said. "But the job opportunities for less-educated males have declined substantially over the past 30 years, and there is a lack of alternatives for them." Boyle, 54, for example, made about $70,000 a year, including overtime, at US Gypsum, and he's had no luck finding anything that will get him even close to that since getting laid off in March. He's tried manufacturers, construction firms, and sand and gravel companies. 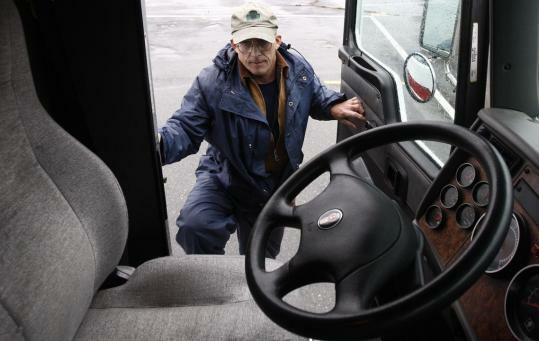 He recently completed training for a truck driver's license. "You go to these places and they don't want to take on anyone else," he said. "It's really tough out there." Finding jobs to replace the high-paying, blue-collar work that traditionally sustained men like Boyle and their families is among the greatest challenges facing the US economy, said the Center for Labor Market Studies' Sum. The erosion of these jobs has undermined both family income and family structure, he said. Inflation-adjusted median income for young families has declined from $44,000 in 1979 to $38,000 in 2007, Sum said. During the same period, as jobs that allowed less-educated men to support a family have diminished, out-of-wedlock births to young women rose to 50 percent of births, from 20 percent in 1980. "We lost a lot of jobs that used to be an opportunity for these young guys," Sum said. "But we haven't figured out how to create good-paying, blue-collar jobs for men who don't have a college degree." Discuss Are you worried about losing your job?